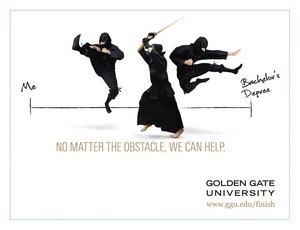 SAN FRANCISCO, CA--(Marketwired - Nov 7, 2013) - Golden Gate University (GGU) rolls out a new advertising campaign targeting undergraduates in November. Titled "Obstacles," the campaign focuses on "stuff" that gets in the way of completing a bachelor's degree, by ratcheting up real-life obstacles. Rather than the typical life challenges of jobs and families interrupting higher education, the campaign features otherworldly obstacles such as an alien abduction, invading pterodactyls and attacking ninja warriors as reasons for not completing a bachelor's degree. The tagline "No matter the obstacle, we can help" offers GGU's expansive, flexible curriculums as the way to beat the obstacle and finally complete the degree. The university offers Bachelor of Science in Business and Bachelor of Arts in Management. The campaign targets working professionals by injecting humor and whimsy into an otherwise serious subject. "We know busy adults are often overwhelmed at the thought of returning to school, but are certain that a degree can make a significant difference for their personal and professional goals," says Cherron Hoppes, Dean of the Undergraduate Programs at GGU. "We think this campaign's humor is both attention-getting and motivating while emphasizing our commitment to student success." The campaign will appear outdoors, online and on the radio in the San Francisco Bay Area. Created by Mortar, a San Francisco-based branding and advertising agency, "Obstacles" will run through 2013 into 2014. Mortar has been GGU's marketing partner for a decade. Mortar is a full-service advertising agency in San Francisco dedicated to finding new and better ways to reach today's slightly angry consumers. Because these days, they're the ones controlling your brand. And they deserve to be entertained, surprised and rewarded.